Well, well, what have we here? I thought, and sidled over. Picked up one, then the other, and dropped into the nearest seat to have a leaf-through. 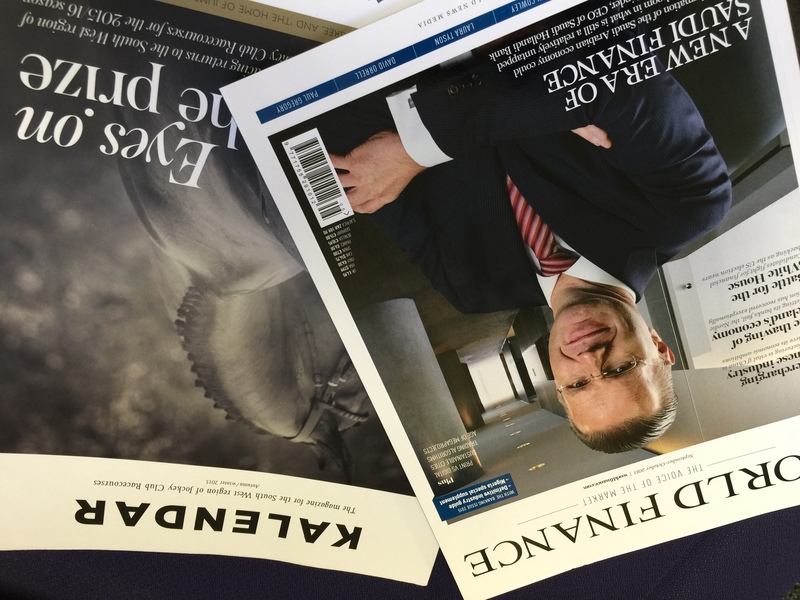 As I dug deeper into my new discovery, World Finance, it occurred to me that we’re all almost overly aware of the go-to business mags – Fortune, Forbes, Bloomberg, The Wall Street Journal and their kin. They’re handy, of course, for our kind of research. But while you may learn a lot about a CEO’s business philosophy, you don’t get much about their philanthropic interests or the people they spend their social time with. 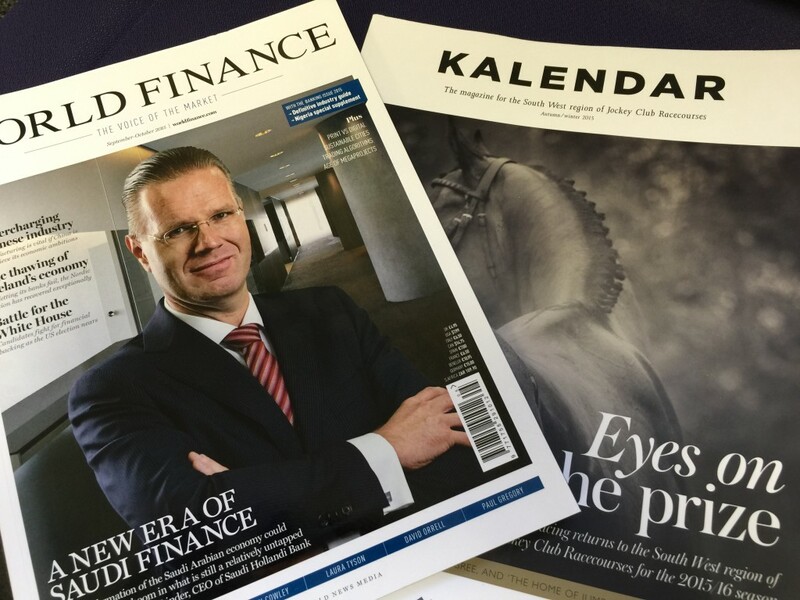 But leafing through these two magazines reminded me that there’s a whole other sea of media that do cover these things, and World Finance and Kalendar magazine are just the tip of a very large iceberg that we ignore at our peril. Archant is the largest publisher of regional and local lifestyle magazines and associated digital media in the UK, with 80 magazine titles reaching more than three million readers every month across the UK and United States. Their numerous titles include Berkshire/Buckinghamshire Life, Royal Ascot Magazine, French Property News, and SW19 Resident. Note: some of the magazines are directly available on the web; others are available only for iTunes subscribers who live in the UK. Moving on from the largest UK publisher to a small boutique operation in the US, Armadillo publishes Long Island Pulse magazine which is worth a look if you have prospects that may have weekend homes near to Manhattan. Recent articles include Two Decades of Collecting Art and The Humble, High-End Winery. Long Island Pulse have a lovely section of People Profiles and also feature descriptions of the top 5 “Haute Habitats” sold each month. Modern Luxury has magazines covering the wealthy and philanthropic in 15 cities/regions including Aspen, Chicago, Dallas, The Hamptons, Hawaii, Miami, Orange County and Washington, DC. Imagine my delight when the first article I saw was an in-depth look at the wide-reaching relationships of several top philanthropists in Aspen written by a fundraiser friend of mine! Specialist Insight is an information-and-events company for the luxury market. Their titles include Private Art Investor, Helicopter Investor and Corporate Jet Investor as well as a handy e-book for valuing private planes called The Official Guide to Aircraft Registration. Spear’s is the magazine for the European ultra high-net-worth (UHNW) individual and the legions of people who make their lives run smoothly, including accountants, bankers, lawyers, art advisors, and family office managers. Of particular interest to us is the Spear’s 500, an annual listing-and-description of the top advisors serving that realm. SPH’s specialty area is the luxury market in Asia. Their feature magazines are called The Peak, which have interviews and society photos of the glitterati in Hong Kong, Singapore, and Indonesia. Other SPH titles include Luxury Insider, with more interviews and photos of Asia’s most affluent people and where (and with whom!) they socialize. “those who have reached the pinnacle of achievement across a wide variety of fields of expertise, as well as those organisations and individuals that lead the way in driving their industries forward. Each year World Finance compiles the list of 100 individuals and companies – not according to capitalisation figures or growth (like the FTSE 350 or Deloitte Fast 500 respectively), but purely on excellence in their field. The 2015 list isn’t out yet, but there are archives of past lists going back to 2009 (!) on the site. European CEO is another one of their titles, but don’t let the name fool you: biographies abound on corporate leaders from around the globe in this publication. Articles range from increasing the number of women on corporate boards to the ins and outs of superyachts. Recent biography subjects include Under Armour Founder and CEO Kevin Plank and Oregon construction company CH2M Hill CEO Jacqueline Hinman. Don’t forget the mainstream regionals: search for mentions of your prospect or their company in a local-to-them magazine like Boston, New York, Chicago, Texas Monthly, Cincinnati and Ocean Drive (Miami). Many times these publications aren’t picked up in LexisNexis or Highbeam Research, so taking the extra time to look locally can sometimes turn up gold. Dig down to local newspapers, too: I live in a suburb of Boston, and every week my community paper does an interview with a local business owner or resident. Also, professional associations are a great place to look…including the Association of Magazine Media itself, which has a great list of members and their publications. Oh, and one more thing: there’s a ton of nouveaux (and not-so-nouveaux) riches to be found in the social e-rags. These ‘zines cover the same beat as society newspapers of old. Samples include New York Social Diary and Social Miami (don’t miss the photos and check out their blog Charity Chat, which also has grip-n-grins). Finally, one VERY BIG thing that a journalist friend cautioned me to remember: Forbes, Fortune and their ilk are mainstream precisely because they are so reliable. They have an army of fact-checkers and they employ seasoned journalists. So, as with everything, do be sure to fact-check anything you find in non-traditional media sources. What under-the-radar publications do you know about? Click on comments and share with everyone!